Established in 1995, Daedalus Technologies Inc. is a professional services firm, providing innovative Modeling and Simulation (M&S) and Interactive Multimedia Instruction (IMI) products and services to government and commercial clients worldwide. 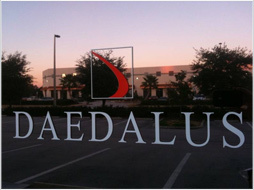 Daedalus is located in Central Florida in proximity to "Team Orlando", facilitating Integrated Product Team (IPT) operations. Our expertise is focused on what we do best: implement client-specific solutions that are efficient, cost-effective and delivered on schedule. To provide innovative, high quality, cost-effective products and services on schedule and within budget to our Simulation and Interactive Multimedia Instruction (IMI) customers. Providing Modeling and Simulation (M&S) products and services to the simulation and training community for over 20 years.